Cantor Seth Ettinger is an avid golfer, Ghostbusters and movie enthusiast, and loves to watch ice hockey. 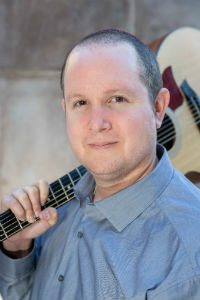 Originally from Los Angeles, Cantor Ettinger received a Bacherlor of Arts Degree in Religious Studies from California State University Northridge in 2009; and a Masters Degree in Jewish Sacred Music as well as the ordination of Hazzan from the Academy for Jewish Religion California in 2014. His thesis entitled, The Therapeutic Aspects of the Nigun, illustrated how Jewish sacred musical modes could be used to alleviate the listener of emotional stress and move them into a more optimal headspace. Before coming to Congregation Beth Israel, Cantor Ettinger served as the first full time Associate Cantor of Wilshire Boulevard Temple; the oldest and largest congregation in Los Angeles. During his five year tenure, Cantor Ettinger spent much of his time engaging the congregation’s youth and developed new multigenerational programs that strengthened interpersonal relationships and identity. He built and mentored the largest synagogue youth choir on the west coast and rebuilt the congregation’s young professional group. Cantor Ettinger is a published author and poet as well as a composer of both Jewish and secular contemporary music. He is the founder of the award-winning Jewish musical group YA-ALEH. In addition to his pulpit duties, Cantor Ettinger is an active member of both the American Conference of Cantors and the Cantors Assembly. “Music is as essential to life as the very air we breathe. Without it, we would cease to be.” Essential to Cantor Ettinger’s life is his wife, Sarah, and their son Ronen.